Meat is one of the significant food comprising the nutritious values targeting health and well balanced diet as it has high source of proteins, vitamins and minerals. It has also become a pivotal part of human evolution. Initially, meat and its product consumption was high due to low cost, pleasant flavor and varied meat food types. However, the time is changing and people are demanding more of healthy, low fat and natural food products which also includes meat diet containing high nutritious values and low fat. Though meat has been one of the dominant food, serious health risks has also been analyzed due to its consumption. Seeing its certain health risks, using vegetal fat and guar gum is considered to improve the nutritional quality of meat and its products. These strategy has been implemented to reduce saturated fatty acid and increase polyunsaturated level which will help preventing health risk and heart disease. While formulation, replacing and reducing the animal fat by vegetal fat, there is visible modifications in binding properties of water and fat. The change includes emulsion stability, texture and color. This behavior occurs as fat is replaced by water. Nevertheless, when sodium alginate and guar gum is added to the formulation there is a reduction in fluid release. Adding guar gum and sodium alginate along with other formulation has impacted a change in its texture, chewiness, hardness and color. After using guar gum with other formulations to create low fat meat, certain analysis has been done from the samples of the meat. Meat containing guar gum had high protein and moisture content and lower in fat content comparatively. It has been analyzed that using guar gum reduces the ash content and it has been noted that, if it is used up-to 1.5% in the formulation, the ash content would be the lowest. The test of the moisture retention in the meat is very much important in the cooking parameters. 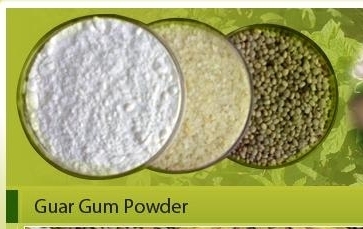 The more guar gum is used during the formulation, moisture content is retained on higher ratio as the quantity of water added combined with guar gum powder leads to proper binding ability. There was another aspect examined during research and testing. Due to the reduction of content and ratio of fat and using guar gum, there is a significant decrease in yellowness of the meat. These examination and conclusion came out in front, with various research done. Reduction in fat content with moisture increase, directly impacted on the hardness of the meat food. Use of guar gum have impacted on the textural properties of the meat and it hardness too. Change is also noted in its springiness. But it is considered that the increase in springiness with higher gum level might be due to gel formed with increased water level. However, if the guar gum content is 1.5% then, it can reduce the gumminess and chewiness of the meat food. So this states, that more use of guar gum leads to better formulation and production of low fat meat diet. Based on various research done by many scholars, it is concluded that the use of guar gum to partially replacement of fat in the meat diet can helps to produce and develop healthier meat and various meat diets. Use of guar gum in low fat formulation leads to higher emulsion stability and cooking, helps in creating economically profitable product. Established in the year 1982, we have gradually outgrown our business wide. We are always focusing on in-depth research and development. Our team is qualified and are updated with latest technologies. We produce guar gum products after undergoing extensive research of its benefits and there applications. We take utmost care of testing and quality parameters. 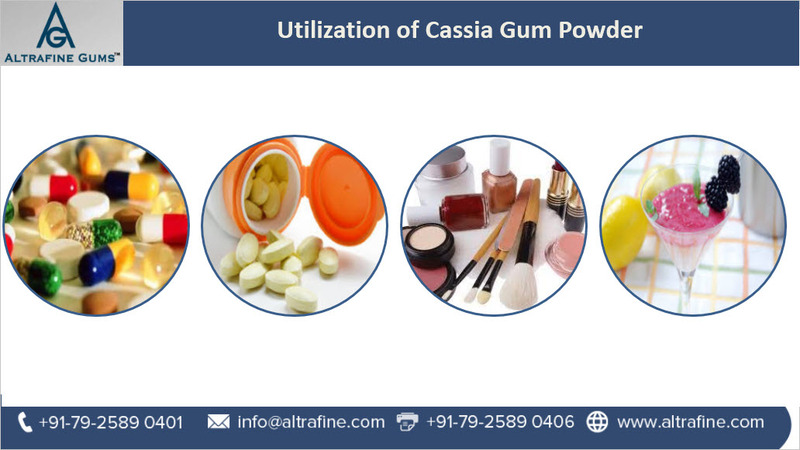 Cassia gum is a food additive produced from endosperm of Senna obtusifolia is also known as cassia tora. It is widely demanded and used as food additives in pet food industry. Today, companies are considering cassia gum significantly in their products as food additives in pet food like food for dogs and cats. It is used as a gelling agent like stabilizer or thickening agent. Cassia gum has varied applications like stabilization, emulsification, and for retaining moisture and more. Usage of cassia gum for cat and dog food includes wet/ canned food, semi- moist food, and dry food. Here, brief explanation is given on the splitting procedure of cassia tora gum seeds. These seeds are heated for some time as husk and germs are sensitive towards the heat and they become fragile, yet the split remains intact. Mechanical stress grind these husks and germs and are separated. Manufacturers of Cassia Gum cleans the material due to which naturally occurring contamination is reduced. Cassia gum manufacturer also de-husk and de-germ the material by thermal mechanical treatment followed by milling and screening endosperm. Further these splits are manually cleaned from the germs that are still stuck. This is briefing of the process although it contains quite a long methodology to clean and make it completely safe. Various research is taking place to make sure that cassia gum is safe for feed additives in dogs and cats food. The research done turned out to be acceptable as positive findings were observed in mutation test for bacteria with semi refined cassia gum. Extensive test was done for 90 days in dogs and cats by providing them diet containing cassia gum. It has been concluded that semi-refined purified cassia gum sets in the frame of cassia tora gum used as food additives which is considered safe to use in food for pets like dogs and cats. According to the latest market report, cassia gum market is expected to increase and expand. There are certain key macro- economic signals and measures that are directly impacting and influencing consumption of cassia gum globally. Basically, cassia gum was used as a substitute and an alternative of guar gum as there was limited research done. Now gradually, awareness is increasing so does the research and development activities are taking place. Nevertheless, once regulation approves the usage of cassia gum all over the world, its demand would increase globally. The use and application of cassia gum is targeted to pet food industry like dog and cat food, and also animal feed. This also includes various other food areas like baby food, dairy and many more. It is important to adhere guidelines and standards crucially to supply and use cassia gum in any form, be the buyer is national or international. India considered to be the major producer of cassia gum and major contributor of the supplier. Market of Cassia gum has been forecasted for high growth in the manufacturing industry which is segmented into cosmetics, paper, textile, chemical processing and more.